ANY internal control system to gain competitive edge? More and more countries are bringing regulations into force that require the documentation and assessment of a company’s internal control system. Often, there is a range of activities to be undertaken in order to comply with the new regulations, but it does not have to be difficult. And it can also bring the company loads of benefits and competitive edge if addressed correctly. However, there are a few things to be considered to avoid spending vast amounts of money that do not bring any return. Based on the experience of implementing, optimising and auditing several companies’ internal control systems, such as the US SOX, this book reveals the methods to a successful and cost effective implementation and maintenance of an internal control system. This book explains the methods Big4 firms use when implementing an internal control system and also the ways in which you can cut down on auditing and consulting fees and improve your entire organisation! “The 7 Secrets to Highly Profitable Internal Control Systems” gives you step-by-step information about how you can implement the whole system while using minimal resources. The book contains loads of hands-on material, like checklists for all significant processes. It reveals best practices from several years experience in the work of internal control systems. It tells you what works and what doesn’t, where the big traps are and how to get around them and foremost: How to save costs and gain competitive edge. The eBook is in pdf format and will be available for download in a few seconds after the purchase. In contrast to the print version, the eBook comes with special bonuses, but only for a limited time. Bonuses no. 1 to 5 have been developed for compliance projects, and would have a value of at least € 250,00 each, if an external consultant would have developed them for you. These bonuses alone would add up over € 1,250.00 worth in consulting fees. Here are the bonuses that are only available for a limited period of time. 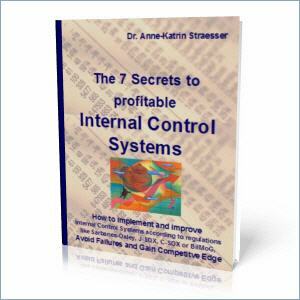 I wish you every success with the book and the implementation or improvement of your internal control system. PS: To receive the full set of bonuses make sure you order the book now.